Start at the Sutherland Drive Entrance to Shell Ridge Open Space. This is a guide to the area around the hill standing in front of you. It is called Fossil Hill. The easy walk for this Nature Trail takes about an hour or more and ends up back here; you will be making a loop by turning right at every junction. This article discusses the geology, flora and things that are most common in this area. 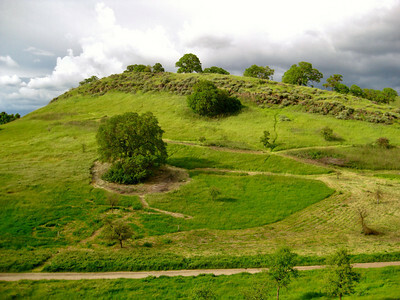 For information on our restoration efforts in this area check out our Fossil Hill Project Page. Look around you. Everything you see was once under the sea. You are now standing about 310 feet above the present level of the sea – even Mt. Diablo at 3849 feet was once beneath the sea. 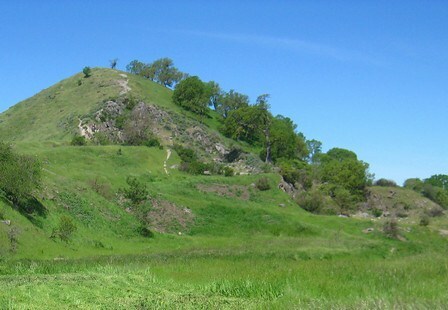 The highest portion of Shell Ridge is some 829 feet high and it, too, was once below the sea surface. Tectonic forces caused by the overriding of the Pacific Plate by the North American Plate caused this uplift along with compressional forces that have tilted the once-horizontal sea bed. How do we know this? Watch for the numerous large rocks with parts of seashells still intact. Also, look at the specks of broken white seashells in the road as you walk along. The tilting of the seafloor broke it into blocks that are now tilted up some 35 degrees and are elongated in the northwest/southeast direction. This direction is parallel to and just a mile east of the Calaveras Fault that runs under route 680. These seabeds were laid down in the Upper Miocene period some 6 to 10,000,000 years ago (for more information check out our Shell Ridge Geology page). Before you start your walk, notice the shadow cast by one of the kiosk posts and mark its position. When you come back, check it again. Look to your right as you walk along the road. Cattle grazing was halted in 1992 so the Open Space Foundation would have a better chance to plant new oaks. Cattle and ground squirrels, over the years, had obliterated all of the new oak seedlings, so only old oaks were here. We estimate the age of some of these oaks at over 300 years. All of the new oaks you see were planted by volunteers coordinated by members of the Open Space Foundation. Foundation members assist the City of Walnut Creek in managing this large area. 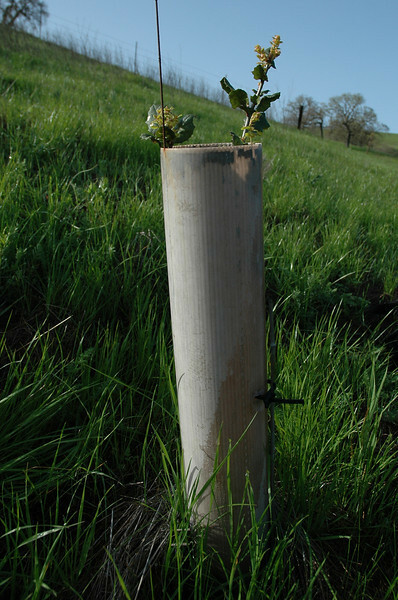 The whitish "Tubex" and screens around most new oaks are buried to a depth of a few inches to discourage ground squirrel activity on the roots and deer activity (antler rubbing) on the trunks. There is an interesting "activity' you can amuse yourself and your kids with the next time you drive across California's Central Valley. Look at the oaks and note that all of them are nicely "pruned off" some 48-1/2 inches from the ground. This is the cattle "browse zone." The branches of many of our oaks are now reaching the ground. Note the quarry at your left. This hill is called "Quarry Hill" (our forebears had a marvelous imagination when they named things). The floor of this quarry harbors many foothill penstemon blooms from March through September each year. They have a beautiful deep blue color. Starting in July, Epilobium (also called California Fuchsia) blooms and these will last until late October and beyond. Its red flowers are a favorite of hummingbirds. Stay right at the fork in the road and proceed downhill. As you walk don't ignore the many birds flitting about. The most common are the red-winged blackbird (usually posing in the tall mustard), the scrub jay (noisy blue and white bird), the bluebird (perched on tall plants), and numerous white-throated swifts, swallows, V-winged turkey vultures, red-tailed hawks, and the occasional small kestrel. Note the "projecting rock" next to the road. There are at least six different colored lichens (black, redgray, red, orange, white and yellow)on this rock. Lichens are a symbiotic assembly of protective fungus that uses living, food-producing, algae. Lichens are epiphytes that can grow on anything above ground. They are some of the most prolific and diverse organisms in the world – they grow near the top of Mt. Everest and in frozen Antarctica. When they die, their decomposition products produce a weak acid (carbonic) that can break down the surface of most rocks. These breakdown products, along with airborne organic matter, produce a deeper soil for mosses to grow. Now, note the mosses, mostly on the north side of this rock. (Spit – or use some other water source – on a dry patch of moss and it will turn green within a few minutes. I guess they think it’s raining! When it is dry outside, these mosses close up to conserve water, which would otherwise transpire as part of their growing and green chlorophyll production. Mosses also help to break down the rock in a manner similar to the lichen. Now the soil is deep enough for grasses to grow, as seen near the top of this rock. All of these elements are present on the north side of this rock. In fact, there is no bare rock visible on this north side – it is all covered by mosses or lichens. Note the orange lichen at the top of this rock on the north side. Orange-to-red lichens thrive in nitrogen-rich environments. Droppings from animals or birds that have used this perch as a lookout are nitrogen rich. The local Indians used this coloration clue to search for local game. Note the fallen oak on your left. It fell over in 1985 but has remained alive since the root system has not been severed. Turn to your right and follow the narrow path just after you pass through the gate on the road. This meadow, on the backside of Fossil Hill, is full of Blue-eyed Grass, Curly-Leafed Soap Plant, Geraniums, and Buttercups in the spring. Vetch is taking over this area, fast but sure. Note the several gopher (ground squirrel?) holes. The small creek at the base of this hill drains an area of about one square mile. In this watershed are two ponds, both man made. 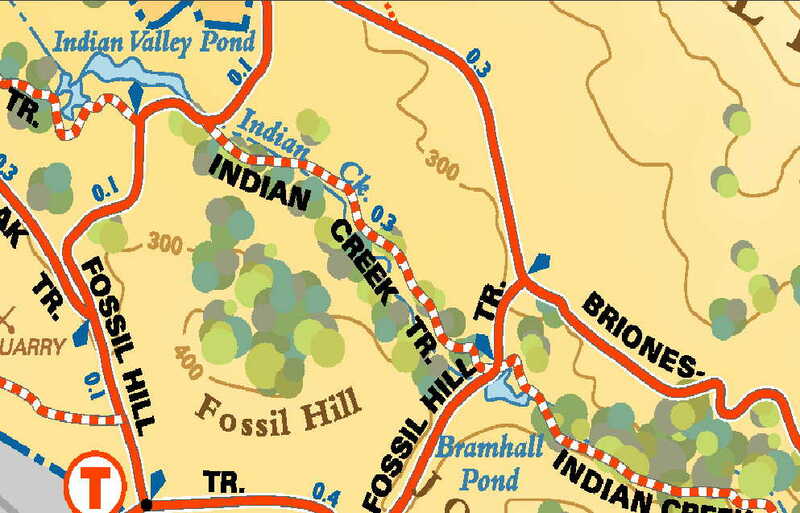 The upper one ahead of you is Bramhall Pond and the one between you and Indian Valley School is Indian Pond. 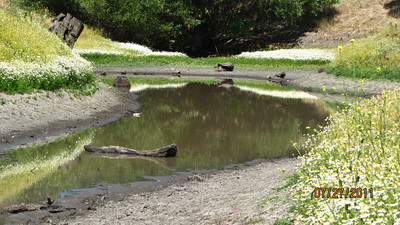 These ponds, in the spring, teem with thousands of frogs and pollywogs and are magnets to dogs off leash. In the fall/winter, the frogs hibernate in the dried mud, only to emerge again when the rains come. Note the mistletoe on many of the oaks. It is best seen in the winter when these deciduous oaks shed their leaves. Most people think that mistletoe is a parasite, but it is only partially parasitic. Note that it is green, so it produces some of its own chlorophyll. Mistletoe does depend upon the tree for water, however, and will rob the tree of its water in drought years. In that way, mistletoe is a parasite, but only occasionally. Also note the many oak galls. If you get the chance to get close to an oak branch, you can see up to a half dozen types of oak galls. These galls form when one of several types of oak-gall moths deposit eggs (through its ovipositor) into either a leaf or bark. This excites the oak as it tries to heal its wound by adding more plant material – much like a scar over a wound. Galls are not damaging to a tree, but sit there benignly. Then the larva emerges from the egg and starts to eat its way out. The larva turns into another oak-gall moth and the cycle continues. If you find a green gall, cut it open and find the wriggling larva. Note the bunch grass clumps along on the right side of the trail. The root system for this grass can reach many feet down to a source of water. Therefore, it stays green all summer long and provides nourishment for several small mammals. Several kinds of lichens may be seen on the larger oaks. Again, these lichens are not damaging the tree, but only use the tree as a substrate. Here you meet the road above Bramhall Pond. The rock wall to the right is partially covered with many colorful lichens and some mosses. Continue up the hill and bear right until you return to the kiosk from where you started. When you meet the road coming in from Ball Road, note the flat area to your left. Forty years ago, this was the Walnut Creek Police Department's shooting range. A metal detector would find tons of old lead bullets buried in this hillside. At the kiosk, check the shadow position of the post you first marked.  The earth causes this movement of the shadow position as it rotates on its axis. At this latitude (38 degrees North) you are turning with the earth at a speed of 818 miles each hour – and you never even felt it!